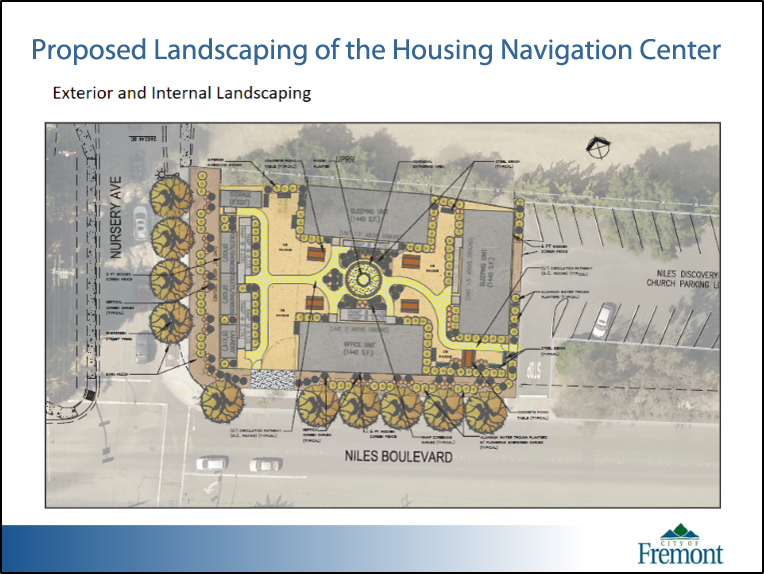 The City of Fremont’s Human Services Department has approached Niles Discovery Church to explore the possibility of installing a Housing Navigation Center on the piece of undeveloped land between our big parking lot and Nursery Avenue, affectionally known as “squirrel hill.” This project will be paid for by a grant received by the City of Fremont for such a purpose. This will include grading and paving of Squirrel Hill, setting up modular units with plumbing and electricity, and fencing off the area. The project would last a minimum of five years. 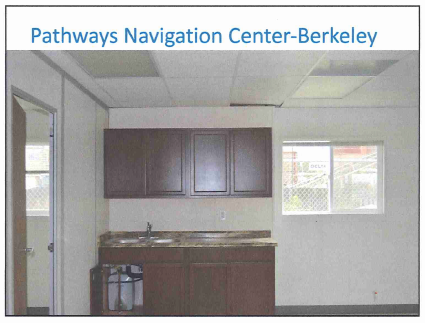 Here is how the Temporary Housing Navigation Center might be laid out on the Niles Discovery Church Site. A fence will be put around the perimeter of the site with a gate for access and exit. The program would have a set number of participants, who would be allowed to stay for up to 6 months (hopefully exited into more stable housing situations). It will not be a first come first serve homeless shelter. It will be supervised on a 24 hour basis. Staff will be onsite at all times. Planning has has been told to not take any parking spaces in the main parking lot. 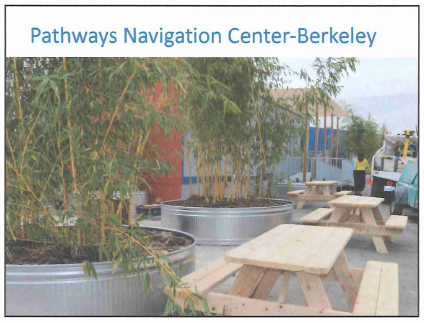 One option is to use the street parking on the other side of the street at the California Nursery. Street parking can also be added in front of the church. This would be relatively easy to do. These would be parallel parking slots. 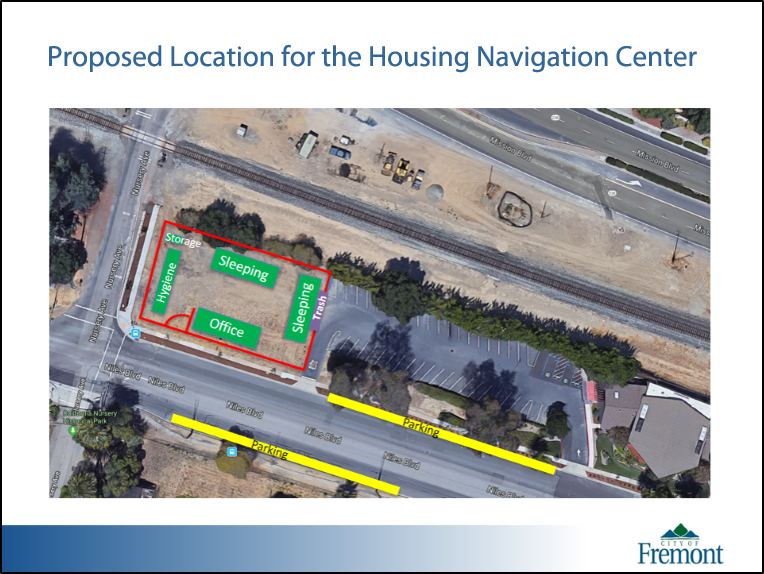 The City is currently developing a Request for Qualifications (RFQ) asking homeless serving organizations for their interest and expertise in operating a Housing Navigation Center for the City of Fremont. In terms of temporary we have envisioned a five year program horizon. This could mean a two to three year operating contract with options to renew. 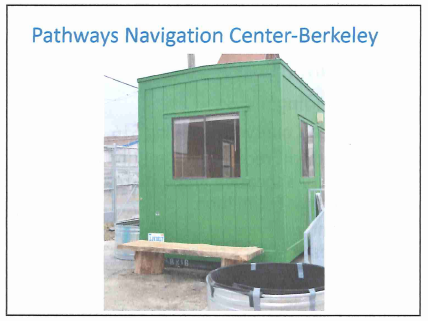 We are interested in replicating the Housing Navigation Model called the STAIR program in Berkeley which has been very successful. We have explained how this model works to members of your congregation. We are hoping to serve up to 45 individuals (adults) for stays of up to 6 months with the focus on preparing these participants for placement in more stable housing. The program as we have indicated will not be a drop-in center. 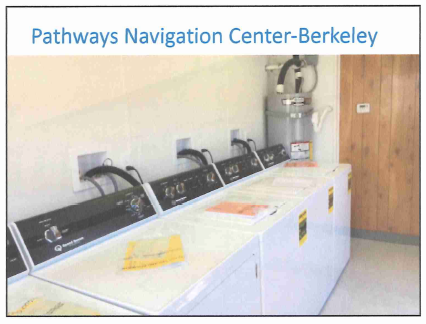 We have been in discussion with several organizations which might have interest in operating such a program in Fremont, this includes Abode Services and Bay Area Community Services. BACS has expressed interest in sharing their qualifications to operate a program and we have not yet heard back from Abode. 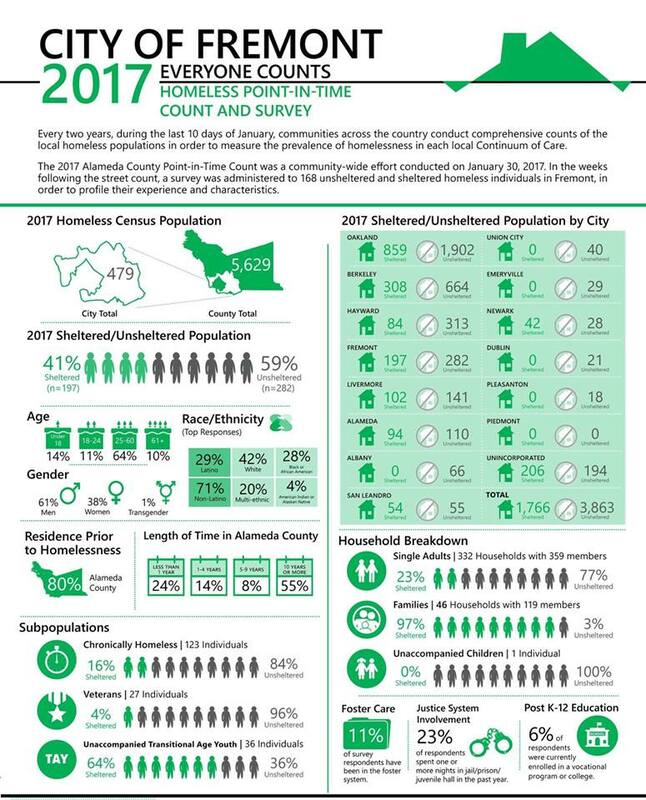 The program which we are developing would help us get more people off the street into safe living conditions and also help homeless participants obtain more permanent housing. This project would augment services currently being provided by Abode, which includes the operation of Sunrise Village (a permanent shelter) where participants currently have no limitation on how long they may reside there. This shelter has provided valuable services, operating for well over 20+ years. 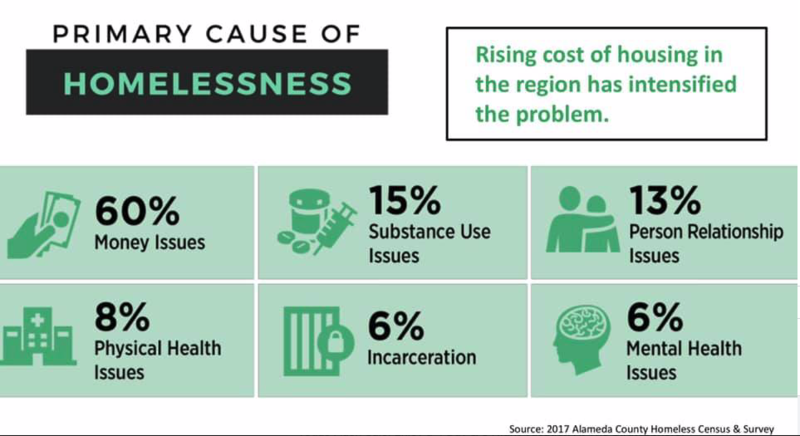 Unfortunately, until recently there has been little opportunity to create additional shelter beds in our area, while the homeless population is expanding. Abode has now become a non-profit housing developer with much of their interest focused on the production of permanent supportive housing for the homeless, a much needed commodity if we are to get homeless folks into stable housing. Each person will write a short bio stating why he/she wants to serve on this committee and get it to Jim by Wednesday. The bios will introduce the proposed members of the Negotiating Team to the congregation before the meeting begins. The Resolution will be shown on the screen. The goal of the Team will be explained- to negotiate the project with the COF so that the outcome serves the mission of the NDC. We will project the health of the church out for five years. The moderator will set the percentage of the voting members required for passage of the resolution and handle any changes to the resolution from the floor. A list of members will be prepared so that people receiving a ballot can be checked off. John and Amy will handle the list and the ballots. Jim and John will represent the Team at negotiating sessions with the COF. Amy will send us links to bios of possible providers so we can read and give our input about that decision. Marilyn will call Steve Armstrong and ask him to sit as a financial advisor to the Team. Bill will look up the name of the lawyer who provided guidance to the Construction Team. It was decided that the Team will meet on Tuesday nights during April and May at 7:30 in Room 1. Amy will record. We talked about finances, parking lot lighting, cameras, parking numbers, palm tree removal. grading of the small lot, possible congregational training for learning to be comfortable with people with issues of the street, and length of service on this committee. We discussed choosing a “friendly name” for the project and proposing it to the COF. The recommendation to negotiate passed with 80% of the voting attendees at the March 31 congregational meeting agreeing. We need to continue reporting back on the status of the negotiation and repeating information often. Easter Sunday will be the first day for a table of information and explanations. Judy will plan this possibly with the Ministry of Social Concerns. Thursday, April 4 at 11:30 at the AMBACS Wellness Center n Grimmer Blvd. Please join Judy, Steve, and Tarrah. Monday, April 8 at 10 – Ardenwood – Building A – Meet with Susan Shenfill, Brian Stott, and Dan Schoenholz for a conference call with Peter Radu from the Berkeley Center. Jim and John will speak for us at the meeting. Please join Mark, Judy, Jim, Jeff, Steve and Tarrah there. 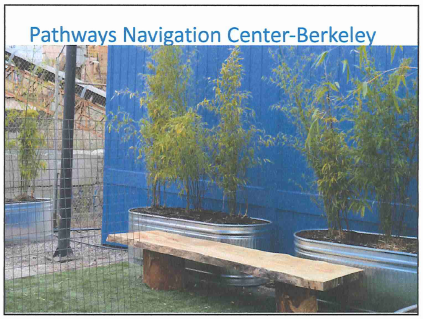 Monday, April 15 10 AM in Berkeley to visit the site. Please join Jeff, Judy,Mark and Steve there. We should carpool. We need a Timeline from the COF so we can stay on track. It needs to include when the issue will go to the City Council. Tarrah is creating/compiling a spreadsheet of issues, concerns, etc. It will show item, status, priority level, who the issue needs to be discussed, ownership/assignment, if it is a deal breaker for us. We will ask that all our items pertaining to the city’s contract with the provider will be satisfied in the service provider’s contract. Steve will contact Bill Hurley. Mr. Hurley was the lawyer who assisted with the construction of NDC. We will ask the Cabinet to create a line item in the church budget and transfer $5000 into it for project expenses. Jeff will write some talking points for us and the congregation. We will reach out to city leaders. Jeff offered to speak to City Council members. Tarrah will reach out to other political leaders not on City Council. Judy will reach out to Niles faith communities. Jim will check with the city and find a date for a community meeting at NDC to present our talking points to all interested residents. The NDC website will continue to provide user-friendly information on the website. There will be at a minimum a monthly (fourth Sunday) update sharing during coffee for the congregation. We talked about trying to do two homeless projects at the same time. We mentioned that the hygiene van would attract homeless people to our site at the same time we are assuring people that all the clients on the site are permanent-temporary residents and known to the provider. We will consider this and pass our concerns to Cabinet. 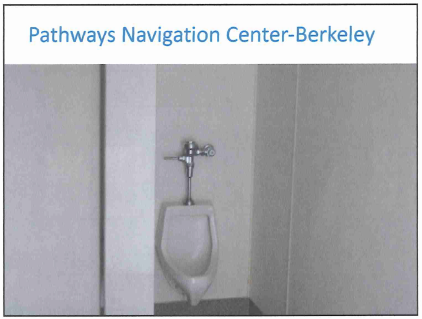 There are some sites near the 3rd St. park that might be more suitable. Jeff will reach out to Dharma Drum as a possibility to recommend. Next meeting is Tuesday, April 9th at 7:30. Marilyn Singer has successfully worked on issues that have guided this church through times of change: a venture with Kidango, Discernment, the renovation of our current building. She has the time and the desire to walk the talk of our inclusiveness and go on this mission trip right in our own backyard. She can negotiate calmly to reach win/win results. Jim Thomas has been the representative for Niles Discovery Church participation in the Abode Services' "Home Warming/Rapid Rehousing" program since its inception in 2009. Prior to that, he worked as the church coordinator for the “Winter Relief Program” that was part of the then Tri-Cities Homeless Coalition. His knowledge and insight to programs that help people transition out of homelessness into a new home is a valuable resource. He continues to seek out new ways of ministry for the homeless. John Smith lives his Christian beliefs and serves Christ by modeling His example and this services as the reason he wants to be on the NDC Navigation Committee. He wants to ensure that Niles Discovery Church Congregation along with the City of Fremont are successful in helping the homeless become housed in our community. His background includes being a Marketing/Merchandise Manager with Levi Strauss, a Realtor, a Board Member of Abode Services, Alameda County Fair, and Kidango, as well as an elected member of the Alameda County Democratic Party, and the Fremont Human Relations Commission Chair. These are all ways that have broadened his knowledge and developed his business acumen. Judy Zlatnik has over 45 years of experience of Fremont’s political and non-profit scene: 10 years on council, President of Board of both Niles Main Street and LIFE ElderCare. She attended the first community meeting on homelessness in Fremont, voted to approve Sunrise Village and volunteered with services to the homeless including Winter Relief. She also has experience as a negotiator and understands the processes of effective communication and negotiation. Throughout these activities, she has remained committed to service “to the least of these” set forth by Jesus in Matthew 25. Bill Palleschi wants to be part of this project to provide a temporary location for homeless because it affords him the opportunity to be proactive in helping the most vulnerable in our community. He has been a member of this church for 40 years. There is a history of social activism and outreach for our community and he has always been a supporter of those programs and of the movers and shakers leading those programs. This program is his opportunity to join the shakers and movers. He has an extensive history in this church as a trustee and in Ministry of Property. He sees this project as a win-win opportunity. Niles Discovery Church can be part of a small but not insignificant program to aid the homeless. Leonard Lloyd, as a former probation officer, retired family therapist, police department delinquency prevention program manager and Red Cross shelter supervisor during the aftermath of the 1989 earthquake, has experience with much of the expected population from which residents at “our” Housing Navigation Center will likely be part of. His goal is to see that all center residents are treated with respect and dignity and included as our neighbors. He hopes to see Christ in each person. Although relatively new to Niles Discovery Church, he understands how hosting this center might impinge on our church and its members. He will seek to see that we as a church and as people are also treated with dignity and respect. He will seek that we love ourselves and we love our neighbors. Iris Nicholson will help with the Housing Navigation Center project as the expression of God’s love for us all. As a retired manager of Fremont’s Human Services Department, her professional background may be helpful. Suzanne Shenfil was her supervisor. Her duties included securing grants, negotiating and administering contracts as well as monitoring contracts between the City of Fremont and non-profit agencies. She is familiar how the City of Fremont negotiates, manages and monitors contracts with local non-profit organizations to address community needs. She is also familiar with the operation of emergency shelters and the needs of people who are homeless having served as SAVE’s Executive Director. In addition, she helped to set up and operate a second-stage shelter in Oakland after the Loma Prieta Earthquake, and initiated the family case management system still in place at Fremont’s Family Resource Center. These are the concerns the Cabinet has identified about the proposal as of January 21, 2019 and addressed at the last Cabinet Meeting. What does "emergency" mean when you call this an "emergency center"? The City has declared a homeless crisis emergency. 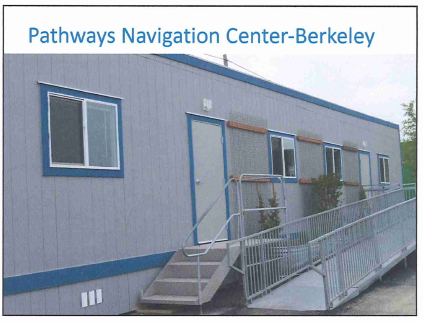 As such, the City is looking to set up a temporary Housing Navigation Center to house 40-45 transitional homeless adults over the next five years as they transition into their next phase of addressing the homeless crisis. What is the city’s timeline? Is the request for 5 for staff? For residents? Could parking be added along the north side of Niles Blvd? How many spots are really needed? What’s to keep people from parking in the church’s lot? Can we use the park parking on days we need it? Would the city pay to reconfigure our parking to gain some parking? 45 additional parking spaces will be set up to set up for the City to use. Thursday nights is a parking issue. Sunday is a parking issue. Big memorial services and weddings. As mentioned earlier, an agreement with the Historical Nursery Park is being considered to use their parking for overflow. (Jim's note: At the memorial service held for Marilyn, we had over 200 attendees. Squirrel Hill was not available due to the unsafe muddy conditions made by the heavy rains that preceded the service. While there was a parking issue, we managed to work through it). In the area near the Church, 45 new on-street parking spaces will be created that will serve the needs of the proposed center, the Church and the California Nursery. This work will be completed by September. How will we keep this a weapons-free zone? Is there going to be a curfew? Can the residents spend their daytimes in their homes? Most of the residents will have jobs and not be around during the day. However, there is no requirement for residents to leave the site during the day. What are you doing to the surface before installing modular? EPA etc. The land will be graded, and compressed gravel will be placed. The compressed gravel provides a permeable base to allow water to soak through, mitigating the need to set up water run-offs. There will be an enclosure with a dumpster. The strip of land where a couple of trees had fallen is being considered as a location for the dumpster. What kind of buildings are going in? How are utilities going to happen? What impact will that have? Sewage, water, and electricity will be built into the area. What will the neighbors say? How will we do with it? There is a requirement to reach out to home owners who live within 500 feet of the proposed center. (Jim's note: We plan to hold a community meeting once we get congregational approval to move forward. I have reached out to other faith groups in Niles to garner their support for this project. The Tri-City Interfaith Council will also be invited to participate). Will this increase the number of homeless in Niles or decrease it? 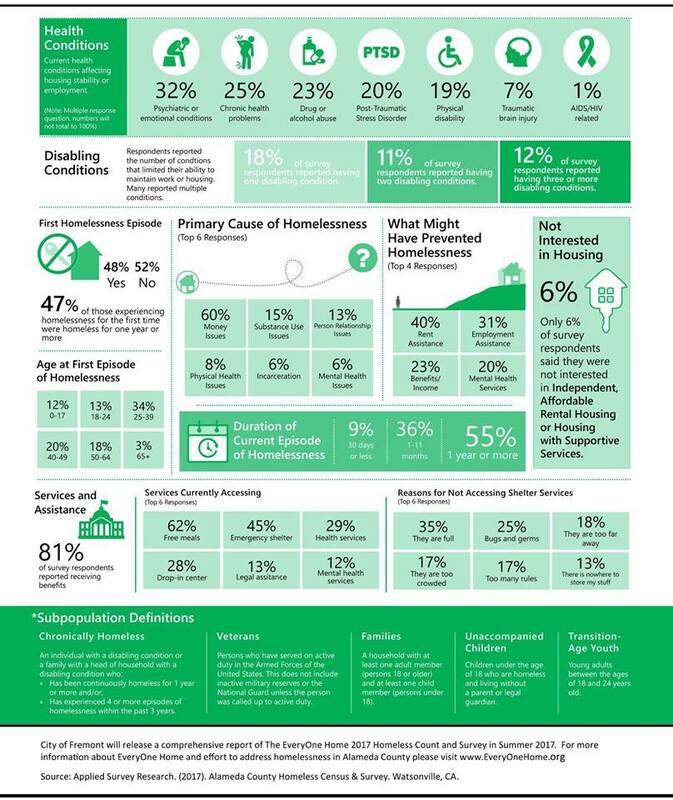 Similar projects in the Bay Area have not seen a homeless population change as a result of the center. Because the selection services are done out of our area, there isn't an environment that would attract more homeless folk. This is a function of the service provider. 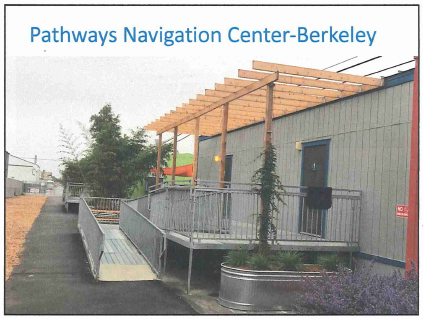 We will tour BACS STAIR unit in Berkeley and their Wellness Center in Fremont. We will also talk with ABODE Services about this. At the end of the term, what happens? If you vacate, what will be the condition of the ground/property when you leave? What’s the decommissioning plan? Typically, the City would restore the property to as close as possible to its original state. Leaving the compressed granite is an option that can be considered. The City's insurance will cover most of that. Staffing is 24 hours, 7 days a week which will help keep things secure. 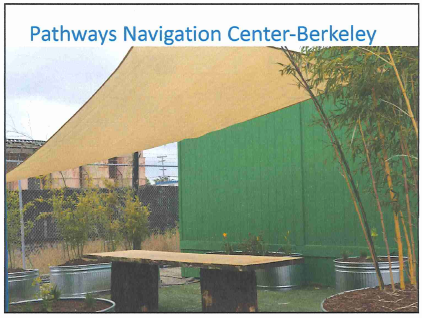 The site will be fenced in with the entrance facing Niles Blvd near Nursery. Are they compensating us for use of the land? A lease agreement of $40K per year is currently being considered. Where are they going to eat? There is a common room for dining where one hot meal is provided daily. There is also a covered area with picnic tables available as well. Will they have transportation for those who don’t have cars? What are the mental health services are you going to provide? What other services? What is the target population? What screening are you going to do? Is this transitional or just trying to get people off the streets? Is this part of a larger program? Bay Area Community Services (BACS) is being considered for the processing of the residents. Residents will be allowed to live in the center for up to 6 months, while case workers help them to find permanent housing. Similar programs have been very effective, meeting or exceeding expectations. This page will be updated as new information is gathered. It was last updated on 4/7/2019.